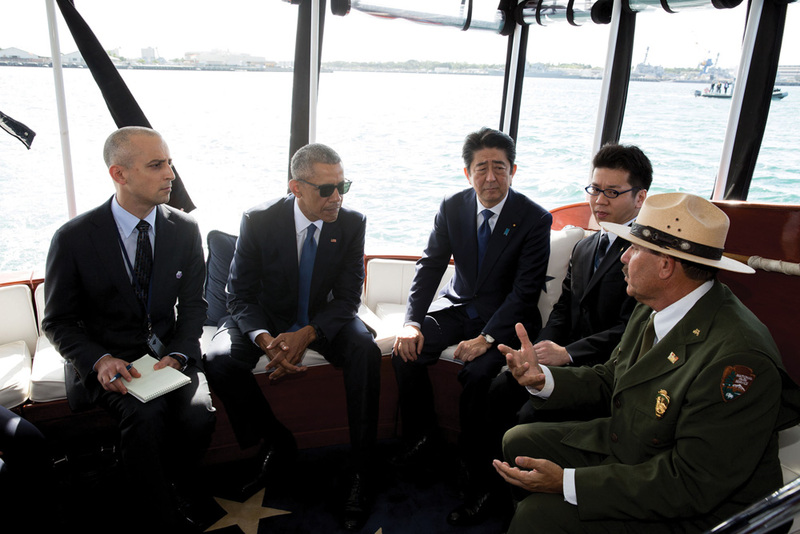 When I first learned from Superintendent Jacqueline Ashwell that I would be aboard the admiral’s barge that would take President Obama and Japanese Prime Minister Abe to the site of the USS Arizona’s wreckage and its Memorial … naturally I was thrilled. But at the same time, I understood that I would be a witness to a moment in history that would be remembered in both nations’ memory and that of the world. However, the gesture of peace and reconciliation that was about to unfold had been waiting in the diplomatic wings of history for 70 years. The destruction unleashed by both sides in the Pacific War was unprecedented in their joint past. Both nations had fought a bitter war, and both have memorial icons that serve as a frequent reminder to the audacity and cruelty of that conflict. 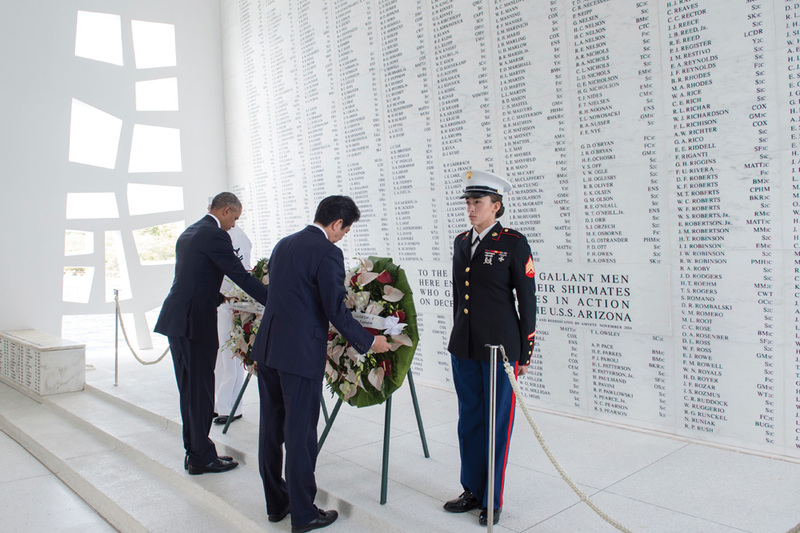 Seven months prior to the visit to the USS Arizona Memorial, President Obama made his way to Hiroshima to pay his respects to the dead and offer a wreath of flowers on behalf of the United States and its people. Years of efforts by both sides allowed them the opportunity to deal with the most sensitive aspects of a shared history. That set in motion for the Japanese government to move forward with a planned visit to Pearl Harbor. The long road to reconciliation was now moving toward closure between these two countries. Abe’s historic gesture of reconciliation was to be offered to the American people. 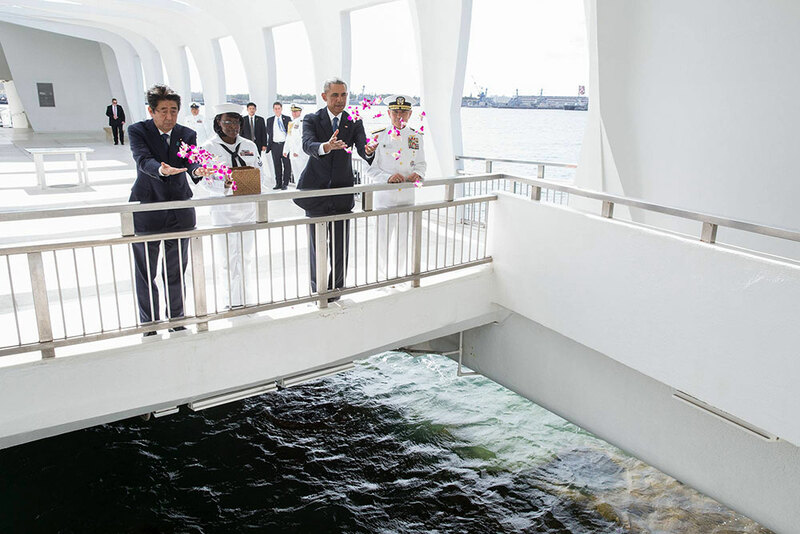 My assigned duties that day were to brief the President and the Prime Minister on the history of the USS Arizona Memorial and the sunken battleship that rested below and to provide answers to any questions they may have. All parties involved waited at the Navy boathouse in Aiea. Within a few moments, it seemed, the limousines arrived with heads of state. They made their greetings with the gathered dignitaries. The superintendent and I were already aboard the admiral’s barge and now looked on as the President and Prime Minister came on board. We both extended our hands to greet our distinguished guests. Also accompanying the President was his sister, Maya Soetoro-Ng, and U.S. Ambassador to Japan Caroline Kennedy. Although there was an air of solemnity, there also was a feeling of celebration for what was about to occur. As we passed into the open waters of Pearl Harbor, we were flanked by robust security of Navy Seals on five high-speed inflatables and Secret Service. The banter between the President and his honored guest was cordial and slightly informal. I sensed that they were very much looking forward to this moment. We landed at the Memorial dock within 15 minutes. Both Jacqueline and I went aboard the Memorial and got to our preassigned positions. I looked down at my watch … it was 12:01 p.m. Shortly after that, President Obama and Prime Minister Abe stopped in front of us. As the camera shutters whirred, I reached for words for that interpretive moment all National Park Service employees dream of … speaking to the President … being there. As I remember it, I spoke about the Memorial’s design, its history and meaning. After that, the President’s party moved to the Shrine Room to present wreaths to the fallen.